Pamela S. Perkins , M.A, Founder & CEO of the Human Communication Institute, LLC www.hci-global.com is a graduate of the well-renowned University's of North Carolina Chapel Hill and New York University. Pamela has over 20 years of experience as a Human Communication Management Specialist, Professor of Communication, Corporate Training Consultant, Lecturer, and academia and corporate curriculum developer. Pamela is a featured practitioner in the Film; Pass It On along with Visionary Dr. Michael Beckwith, Motivation Speaker Les Brown and Productivity Consultant Denis Waitley. She has made Guest Appearances on KPBS, MTV, NBC, Cox TV, Voice of America, Talk Radio WHCR 90.3 FM New York and Big Media USA – Smart Talking Women Inc. She is Co-Host of a 2008 pilot Talk Show: InWORD OutWORD Conversations about Communication. Her current list of clients include: San Diego State University, EMBRACE Program, SD Black Engineers, Qualcomm, and San Diego KPBS, to name a few. She is currently Editor-in-Chief of Diversity Works Magazine and a contributing writer for the Personal Development Magazine www.hci-global.com/pdmagazine Her cultural studies are extensive and includes an international post with The Instituto Italiano, Florence, Italy. Past Co-Director of the prestigious World Cultures Program, Pamela produced, directed and facilitated cross-cultural programming for audiences and participants from around the globe. Specializing in Intrapersonal, Interpersonal, Nonverbal and Intercultural Communication practices, she is creator of the Human Communication Institute, Communication Staircase. Author of the Spring, 2008 hardcover New York Time review release of: The Art and Science of Communication: Tools for Effective Communication in the Workplace, publishers John Wiley & Sons, Inc www.wiley.com her unique and effective and transformative approach to healing the communication environment has positively affected the lives of thousands. NJ Mitchell, MBA grew up in a small town forty miles east of Orlando Florida the eldest of six children. She traveled the United States playing semi-Professional softball for 17 years which includes many individual and team trophy Awards. She has her MBA complimented with a degree in communication. Since then, opportunity has knocked twice more, first at the Human Communication Institute, LLC and then in the Entertainment Industry. She is a Company Principal, VP of Operations & Marketing and brings to the professional HCI team a special brand of organization, motivation, personal coaching and team confidence building skills. Secondarily, she manages the HCI, LLC practitioner PASS IT ON Film project and is the R&D Manager of the Diversity Works Magazine. She can also be seen in a few movies and HBO shows if you look hard enough. She is a student at Van Mar Academy Hollywood. (Ivan Makota). She received the 2008 National Campaign Billboard for Mother's Against Gun Violence (Photography: Jeffery Lamont Brown). She is also apart of the large Mural at Carlsbad/Leucadia Beach Mobil Gas Station (Artist Kevin Anderson). She is active with the San Diego Film Festival SDFF. She is Co-Host of a 2008 pilot Talk Show: InWORD OutWORD Conversations about Communication . Her passions are to jump through hoops until she sees the lights come on in a child's eyes, to sit at the feet of recorded history - our elderly and you can find her studying scholarly spiritual works in nature with a hot cup of fresh brewed coffee. Her hobbies are play by play calling NBA games (favorite team the Miami Heat), international travel with friends, research work, writing and sharing notes about thoughts that invade her mind and beg to be remembered. Have a wonderful day. It's always your choice! 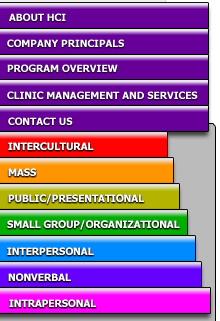 We encourage you to visit our site www.hci-global.com and contact us to create a specific communication training support program for your team.